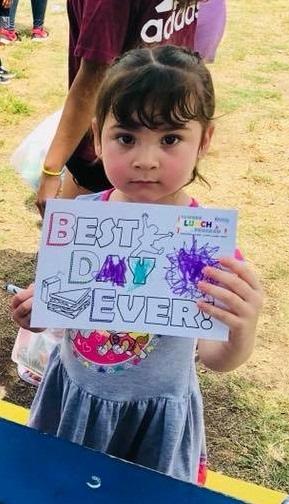 Frisco Family Services was one of seven nonprofits that were a part of the second annual Dallas Morning News Charities' Kids' Summer Feeding Campaign. 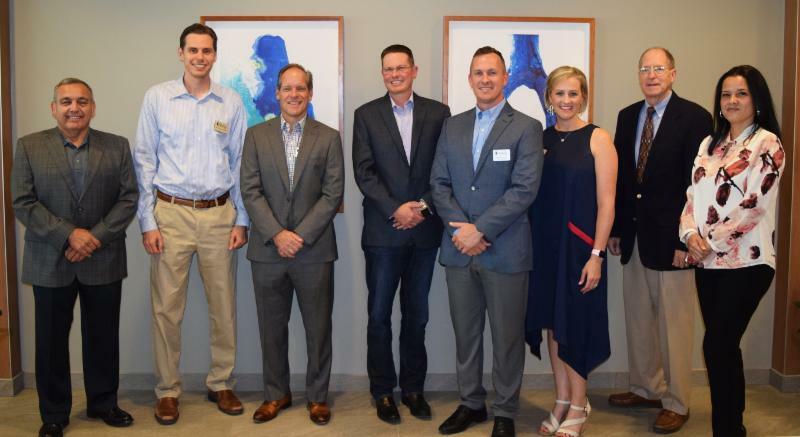 Beginning on May 23, 2018 and ending on June 29, 2018, the initial goal was to raise enough funds to provide 60,000 meals for North Texas children during summer break. The amount of support received from the community was incredible, and because of your help, the initial goal was exceeded by 20,000 meals! A combined total of 80,000 meals are being distributed to North Texas children this summer. New members include Shane Arledge , Consultant; Russell Goin , NewcrestImage; Michael Howard, Parkhill, Smith & Cooper; Shanna Keaveny, Texakoma; Lesley Regalado, Career Resource Services; Tom Reitinger, Community Volunteer, Abel Silva, Validus Technology Group; and Martin Thornthwaite, Clark Hill Strasburger , who joined the board on July 1, 2018. 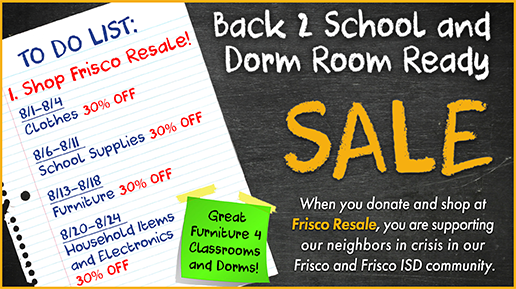 Take advantage of some great sales this month at Frisco Resale, and support your very own community at the same time! think about making a regular commitment to your community and volunteer at Frisco's only Community Food Pantry, Frisco Resale, or Frisco Family Services' Front Office. Ready to make a difference in your community, but not sure if this opportunity is right for you? ﻿Frisco Family Services and the volunteer opportunities available. ﻿Orientations are on Wednesday, from 5 p.m. - 6 p.m.
and Fridays, from 4 p.m - 5 p.m.
Click here to learn more, or to join us for an upcoming orientation. Our 2018 Summer Lunch Program comes to an end with a Grand Finale event to celebrate another successful year of Lunching, Learning and Laughing on Friday, August 3rd. 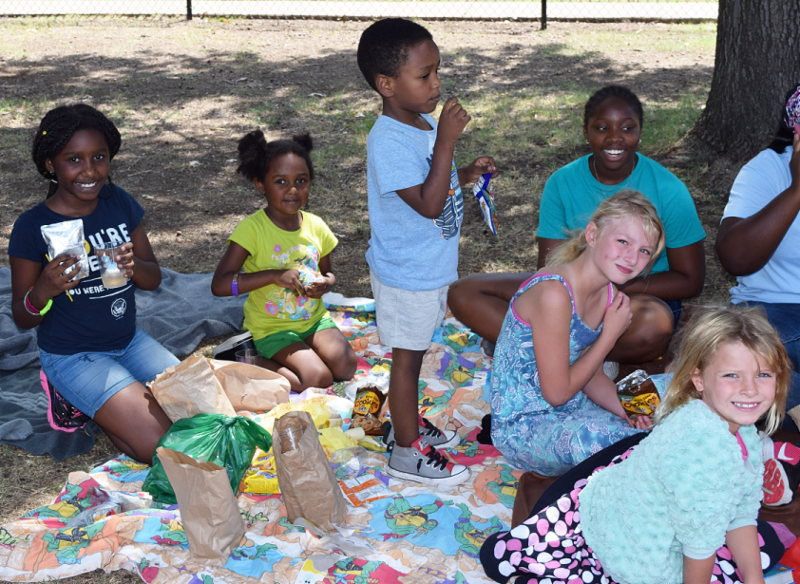 For the past 9 weeks, more than 9,000 lunches and snack packs were provided to kids in our very own community. Participants not only got to nourish their bodies with healthy meals and snacks, but they also participated in games, reading and social time. At our Grand Finale event, thanks to our passionate volunteers, like a group from Frito-Lay - PepsiCo, more than 300 children and their families will have the opportunity to participate in a variety of games, social activities, a raffle, and go home with food and snacks to help with lunches until school starts. Save the Date for Gala 2019 - ONE! You won't want to miss this spectacular evening full of ONE community coming together for ONE purpose. We are excited to announce that we are currently in the process of launching a new website design to help better serve you! Our new website will be faster, easier to navigate on a desktop, smart phone or tablet, making your experience on our website much more efficient. We’re currently still in the building phase right now. Thank you for bearing with us but the wait will be worth it. Keep an eye on our current website for more information soon !